Night time alerting. Most often it is the number 1 reason someone cites for wanting a DAD. And it is often followed up with “and then we can sleep through the night” as if the dog will catch the low, go get a juice box, treat the low, and then go back to bed. Or catch the high, bolus to correct, and do all of that while you stay snuggled up in bed. Sounds silly, doesn’t it? But people really believe that with a night alerting dog, they will sleep more. I’m here to tell you a few things. First, not all dogs will alert at night. 2nd, to get one that does requires a lot of work, constant work, and yes, for you to be up with the dog at night. 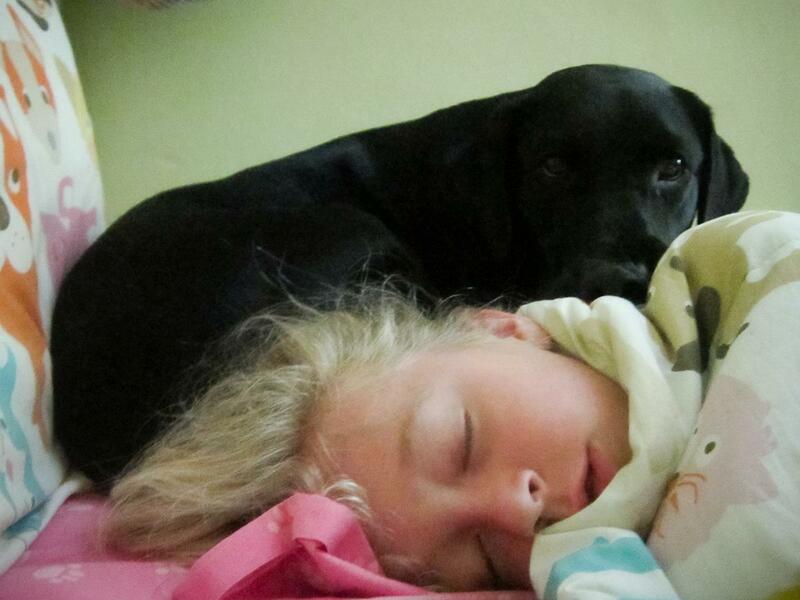 And 3rd, with a night alerting dog, you will wake up more than you ever did before. We have 2 DAD’s. Why? Because try as we might, Major just won’t alert at night. Whether it was past abuse, a mental block, some hard wiring we can’t overcome, we just haven’t been able to get him to do it. He will alert just about anywhere else. And we have tried everything, every scenario, every type of reward, food, fetch, squeaky toys, etc. I truly believe it is a remnant of his abusive past. So after awhile we were okay with it. Not happy, we wanted a night alerter, but he is so good at everything else that we accepted he wouldn’t alert. Why did we think it was important to have a night alerter, especially if we knew we still needed to get up anyway to check her? Redundancy. Fast, unexpected drops or rises. a little extra piece of mind. See, night time is a scary time for a parent of a diabetic. Our daughter suffers from dawn phenomenon, meaning that every night around 2:30am, her BS starts to rise. And it seems that no matter what we do with her basal rates, like setting them higher between 2-6 am, diabetes outwits us, and sends her BS higher. I won’t even discuss “dead in bed” syndrome here, but my daughter is also hypo unaware, meaning she can’t feel her lows, so she won’t wake up to correct them. But our bigger, daily concern, is her waking up with BS in the high 2-300’s. And with that, we deal with headaches, groggy poor sleep, focus issues at school, etc. Not a great way to wake up. So we check her when we go to bed, and then set an alarm for 12 and 3 am to check, and then again when we wake up for work. So what do we need a dog for? Well, because this happens every night, we are tired. Everyday. And occasionally, the alarm will go off, and we will hit snooze. Or forget to set the 3 am alarm. Or something drastic will happen at 1:13am. So we wanted a backup system. And that is what Raven is for us. She is our back up, our redundant emergency system. There have been countless times when she has woken us up between alarms to alert to an issue, or alert, and we realize there was no alarm set. She has woken us up when BS was rising, and the battery in the pump went dead and wasn’t giving any insulin. She has alerted to rising BS and we have discovered that the pump was still on the bathroom counter after Stella’s shower. She has saved us, backed us up, lots of times. We initially “borrowed” Raven. One of our last ditch efforts with Major was to bring in a good night alerter, and see if that might rub off on Major. 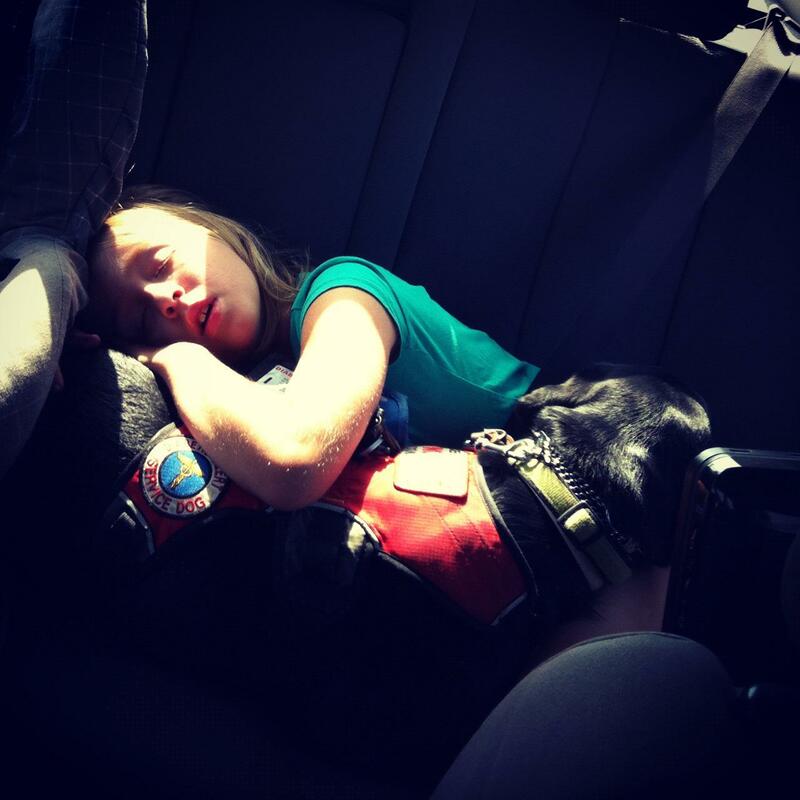 When we approached Crystal of Canine Hope for Diabetics (the head of our service dog organization) about borrowing a dog, she had just the pup. You see, Raven is a good “home” alerter, and an excellent night alerter. But she struggles with public access at times, she is a barker, and she can be protective of her people and space. So Crystal couldn’t place Raven in a home, and was considering either re-purposing her (perhaps for Search & Rescue work) or having her become a pet. And that would have been a shame as she is a really good alerter. The rest, as you know, is history. 🙂 Now here is where it gets tricky. We brought Raven in, and she didn’t work for us right away. We needed to work hard with her to find a solution, and it took us about 3 weeks. You see, when Raven was trained, she worked with an adult type 1, sleeping in her bed, and alerting directly to her, waking her up. We, as parents of a child that is, how shall I say, tough to wake up, and can sometimes be, um, surly ;), needed a different type of alert. We needed her to wake US up, so we could go take care of the issue. First we worked on having Raven alert to us, and that was quick and easy. Then we needed to work on the night time arrangement. 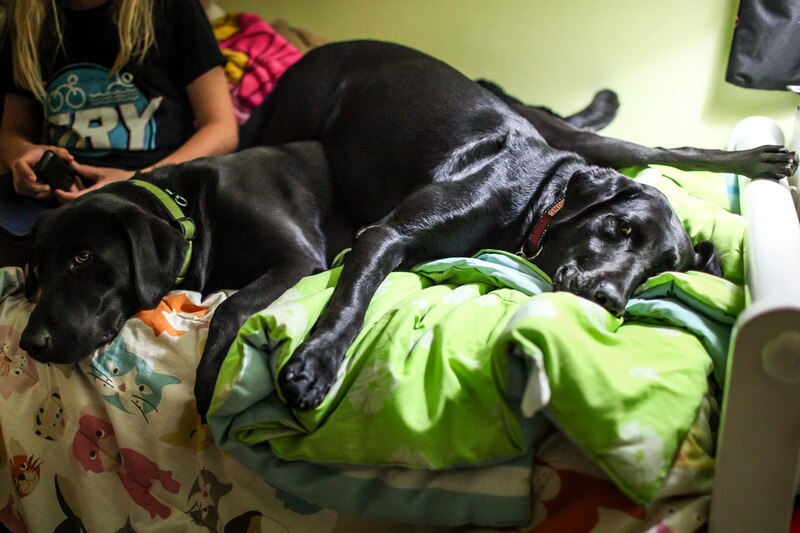 We tried lots of different scenarios, with Raven in bed with Stella, Raven on the floor with Stella, Laurie in Stella’s room, Raven in the hall way, on a Kuranda, on a dog bed, on the floor, and every possible iteration there of. We were ready to send her back, and met with another Canine Hope trainer, Tracy, that mentioned tethering her to our bed, having her sleep on a Kuranda cot right next to us, and seeing what happens. We did. and here is what we determined, specifically to Raven. She gets comfy in a bed. And when she is comfy and warm, all snug, she sleeps. Hard. So when we put her on the Kuranda, it was kind of like a Marine out sleeping in a war zone. She keeps 1 eye open. She sleeps really lightly on the Kuranda, and is much more likely to catch the scent and wake up. And the Kuranda with the vinyl like material is noisy, so when she starts to rouse, we are more likely to wake up. 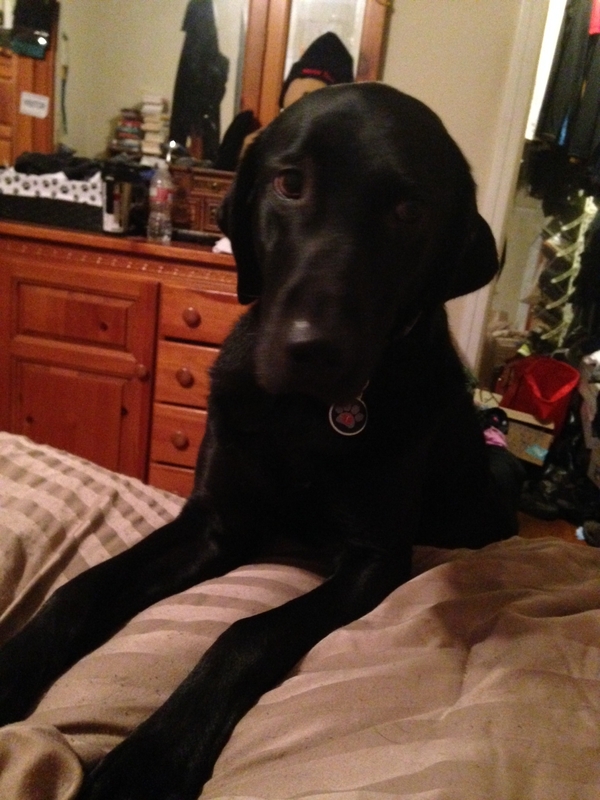 And when she gets the scent, she stands and puts 2 paws on the bed and starts rooting with her nose to get me up. 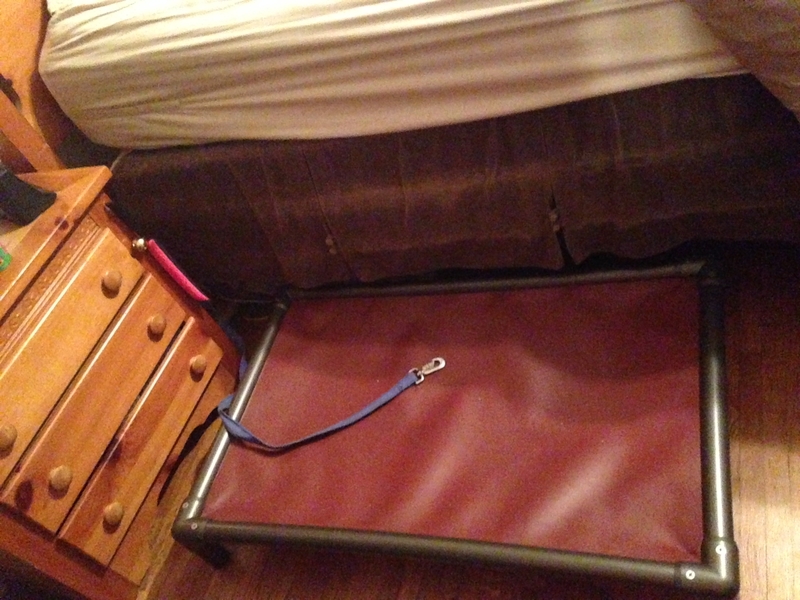 Here is a picture of our set-up, Kuranda on the floor, and the tether (an old leash) that is wrapped around a bed post. We have a bringsel with a bell sewed on (this is new, and I am going to try working this out soon) on a hook on the night stand. 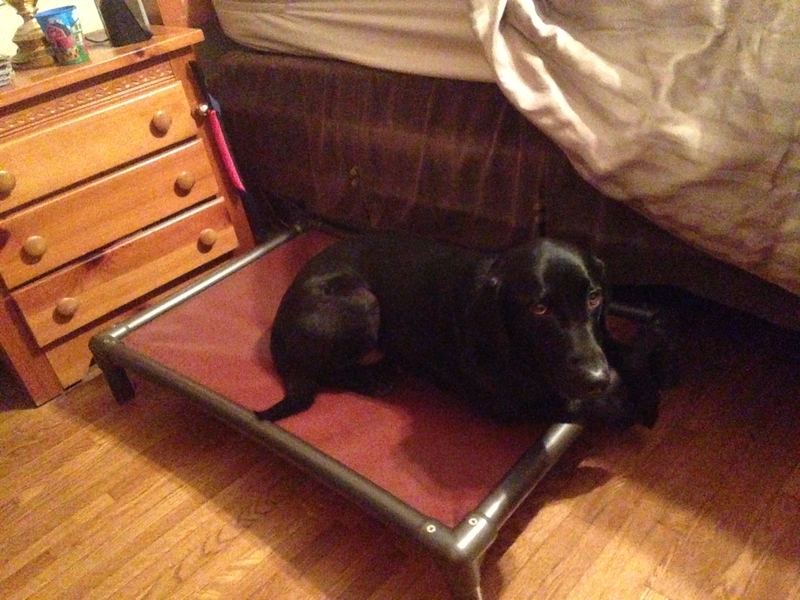 No fleece pad on the cot. We no longer use the tether for Raven, she doesn’t need it, but when there is a new dog in the house, we use it to keep them in bed. When there is an issue or a check, we release them and take them with us. Again, this is what works for us. Some people have dogs that alert from in their bed, from in crates, from their children’s room, that ring doorbells, there are all kinds of ways to make it work. And on occasion, it stops working, and something needs to be done to kick start it again. If you have a busy day out and about, and the dog has expended lots of energy, the dog may sleep through the night. If the dog isn’t feeling well, or if there is a new dog in the house that has upset the balance, or perhaps the reward treats have gotten boring, it may be time to switch things up. 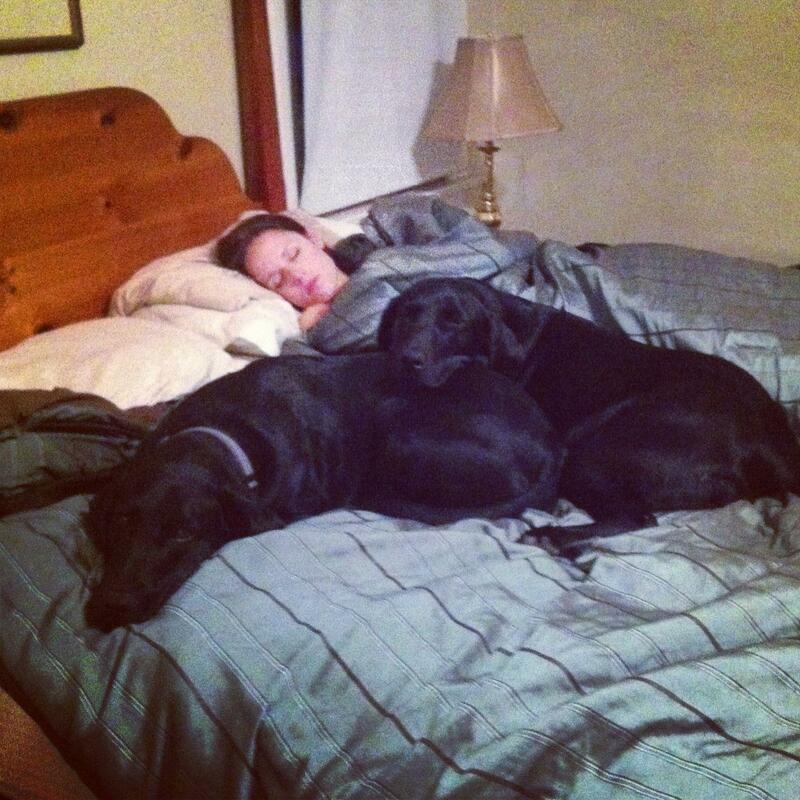 Dogs will also start to anticipate alarms, so it is always a good idea to change those up every other night or so. I hope this helps. And know, if you have a night alerter, or want a night alerter, you WILL be up at night, and you will need to work hard to keep it up. And ALWAYS remember. The dog is NOT responsible for your child’s life. YOU are. 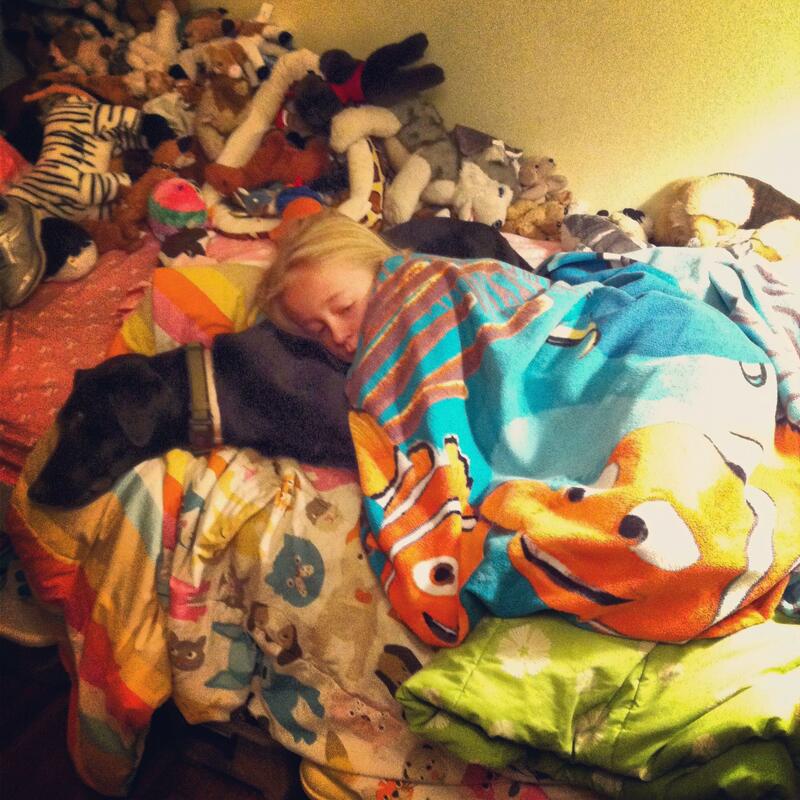 Do you have the dog in your room or in your child’s room? Raven is in our room. One less hurdle for us to overcome. She just has to get up on her Kuranda and that is generally enough to wake up either my wife or I. So she can pick up the scent without being in the same room as your daughter? How far away is your daughters room? We are at the beginning stages of training our DAD and are very curious about the night alerting and how other parents have trained their DADs to wake them up. This is all very interesting and well-explained. I have a 14 year old T1D son, diagnosed for a little over a year, and I’m a dog trainer. I’ve been curious about the specifics of training a DAD and didn’t really understand the benefits over a CGM or how the dog would alert at night when sleeping. Thank you for your explanations.